This highly flexible and cost-effective Transas Coastal Monitoring Solution provides full control over an entire coastal area even in the most adverse weather conditions. 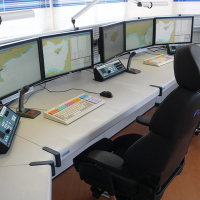 Based on the Transas Vessel Traffic Monitoring software, the system is capable of providing the Coast Guard/Board Control with real time data on any activities occurring in a coastal zone. Multiple sensor (AIS and Radar) tracking instantly detects even the smallest targets, supporting decision-making process. It helps to prevent illegal activity in the zone and to protect critical onshore infrastructure from intruders. Wider coast coverage can be achieved by installing multiple command centers along the coastline and linking them to the main control center. Integration with radar and AIS systems provides full coverage of necessary area.